The Weston 36-3601-W multi-grain cereal mill makes grinding an effortless task with its impressive design and high maneuverability. It can easily grind multi-grains, soybeans, corn, or shelled nuts while adding freshness and high nutritional value to your favorite recipes. It highly rugged cast iron construction offers durability for your life time. This cereal mill features high adjust-ability from coarse to fine disassembles, facilitating quick and easy clean-up. The Weston 36-3601-W multi-grain cereal mill is ergonomically crafted to quickly and effortlessly grind multi-grains, soybeans, corn, or shelled nuts, enriching your favorite recipes with freshness and healthy nutritional content. Constructed with cast iron material, it features durability and services for lifetime. 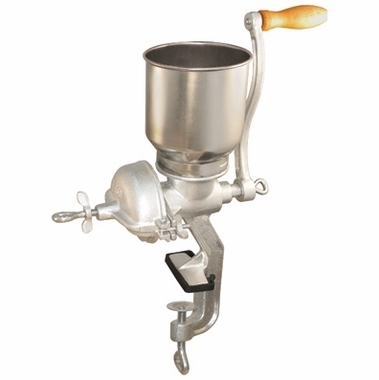 The Weston 36-3601-W multi-grain cereal mill incorporates a large heavy duty crank that turns swiftly for ease of use. It can easily adapt and adjust for coarse to fine and disassembles, giving away a quick and easy clean-up. Just make sure that the clamp on the cereal mill attaches to any countertop, while the rubber mount pads defend even the most delicate surface.